The leader of a Taliban faction, Qari Zainuddin, second right, who was fatally shot reportedly by one of his own guards on June 23. Qari Zainuddin was asleep when his assassin struck, although the 26-year-old militant leader had been preparing for battle. 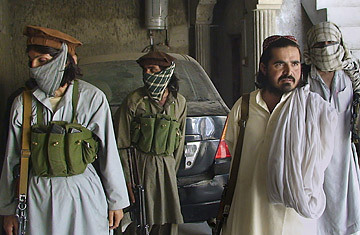 Zainuddin was poised to join the Pakistan army's fight against the Taliban by leading his own militia to take down Baitullah Mehsud, Pakistan's most feared and murderous Taliban commander. Zainuddin had denounced Mehsud's brutality but he also had deep personal motives for joining the fight  Mehsud had killed his father and other relatives, Zainuddin said, obliging him to take revenge. But early on Tuesday, in the dusty and wild northwest town of Dera Ismail Khan, Mehsud appears to have struck first. After rising for dawn prayers, Zainuddin returned to sleep, and was shot dead by one of his own bodyguards who fled the scene in a waiting car. Zainuddin's men believe that the assassin had infiltrated the group and killed their leader on Mehsud's orders  an action widely interpreted in Pakistan to as a message to others to avoid following Zainuddin's path. The assassination of a powerful local warlord willing to fight Mehsud is a blow to the strategy of the Pakistan security forces of turning local militia against the Taliban. It also casts fresh doubts over Pakistan's enduring habit of aligning itself with lesser-evil militants in order to tackle larger, more immediate threats. Recent history has shown not only that the policy has yielded poor results and sometimes backfired disastrously, but it's also at cross purposes with U.S. efforts in Afghanistan. For all his loathing of Mehsud, Zainuddin was scarcely the model of a local hero rising up against a tyrant. In recent interviews, he pledged fealty to Mullah Omar, the leader of the Afghan Taliban, declared his fondness for al-Qaeda, and waged 'jihad' against U.S. and NATO forces in Afghanistan. A key element of his quarrel with Mehsud was a difference in militant priorities: While Mehsud and his allies in the Swat Valley were principally fighting against the Pakistani military and attacking Pakistani territory, Zainuddin believed that it was wrong to attack fellow Muslims and wanted to focus their fire on Western forces in Afghanistan. Still, Zainuddin was clearly of some use to the Pakistani military. The militant leader hailed from Mehsud's tribe and came from the same area. The army has insisted, with good reason, that it needs local support to be able to take on the likes of Mehsud. Zainuddin, if his claims to command thousands of fighters were to be believed (and many analysts believe they were inflated), could have helped the army destabilize Mehsud by forcing him to fight on two fronts. A similar arrangement in 2007 with two different and more powerful militant leaders proved disastrous. When Maulvi Nazir of the rival Ahmedzai Wazir tribe in South Waziristan took on Mehsud and Uzbek groups aligned to al-Qaeda, the Pakistan army backed him. After his men killed 250 Uzbek fighters, the army entered a nonaggression pact with Nazir and his associate Hafiz Gul Bahadur. But Nazir continued to attack U.S. forces across the border, and was targeted in air strikes. Enraged, Nazir and Bahadur shed their differences and formed a new alliance with Mehsud earlier this year. Now, all three groups could be lined up against the Pakistan army when it presses ahead with its counter-insurgency operation in South Waziristan. The alliance with Sufi Muhammad, the hard-line cleric it enlisted to broker peace in the Swat Valley earlier this year, proved equally disastrous. Muhammad's politics were well known: during the 1990s he had waged a campaign of violence for the imposition of an austere form of Islamic law in the Swat Valley, and in late 2001, he led hundreds of young men to fight the U.S. invaders in Afghanistan. He had been imprisoned upon his return, and released last year on the condition that he disavowed militancy. To head off the prospect of Swat falling to Taliban fighters loyal to Maulana Fazlullah, Muhammad's son-in-law, the government tasked Muhammad with urging his former disciple to lay down arms in exchange for the government's implementation of Islamic law in the area. It soon emerged, however, that the Taliban had no intention of laying down arms, but instead sought to extend its reach, and Sufi Muhammad turned out to be an active enabler of their advance. Given the profusion of militant groups that operate in South Waziristan and the tribal areas, the Pakistan wants to avoid having them all arrayed against it at once, which would drain resources to fight on multiple fronts. Already, there are grave doubts about launching an operation against Baitullah Mehsud when gains made in Swat and neighboring districts have not been consolidated. But, as some Pakistani analysts point out, there are other options available. "I have no doubt that [Pakistan's armed forces] do need local support," says Cyril Almeida, assistant editor at Dawn newspaper. "There are two ways of doing it. The lashkar route [local anti-Taliban militias] is one of them, which means supporting a genuine form of rebellion. The other route has been making deals with these unsavory characters like Qari Zainuddin. Unfortunately, in South Waziristan, the state has decided to use the short-cut route of just propping up the latter."